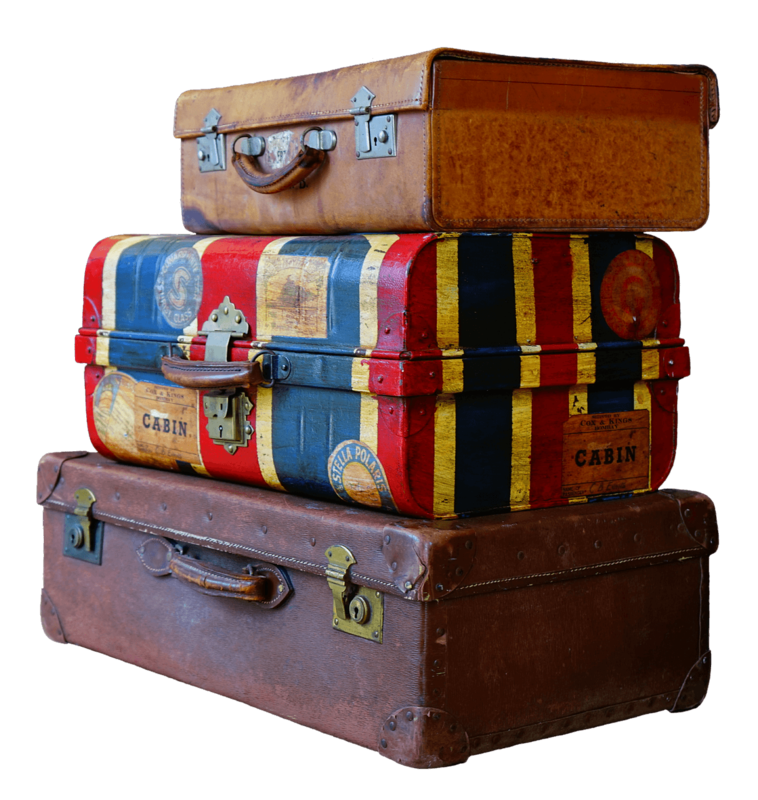 Planning a family vacation to Tampa, Florida? Looking for a kid-friendly restaurant with delicious food? 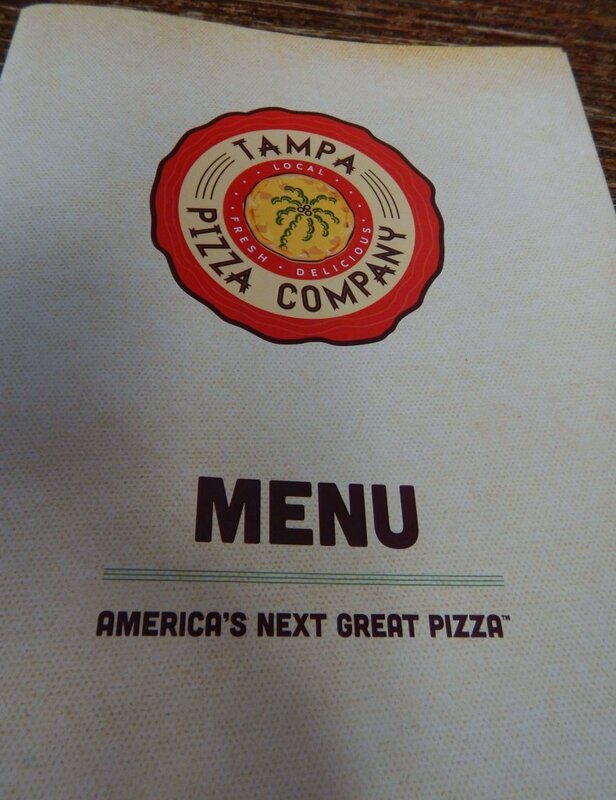 Look no further than the Tampa Pizza Company! 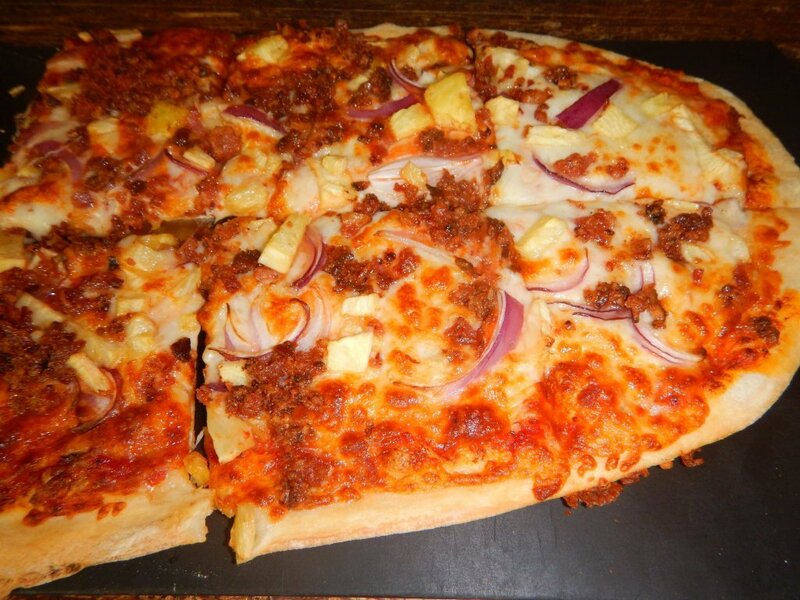 Their inventive and tasty pizzas are something the whole family can agree on. On a recent trip, my son and I loved this yummy pizza so much, we ate here twice! It is a kid-approved dinner for the whole family! As you might expect from a place named the Tampa Pizza Company, pizza is their specialty. The artisan-style pizza menu includes traditional favorites such as pepperoni and hawaiian. But, they also feature creative combinations like pear and gorgonzola or the prosciutto pizza, which pairs proscuitto and goat cheese on a fig jam base and topped off with arugula. If you prefer, you can make your own pizza, choosing your favorite sauce, cheese, and toppings. Other items on the menu include salads, sandwiches, wings, and chicken tenders. They also serve cheesy garlic breadsticks, stuffed mushrooms, Italian meatball sliders, and other appetizers. For dessert, choose from nutella dessert pizza, cookies, cakes, and gelato. They offer a selection of wine and beer for adults too. If you have someone in the family with special dietary needs, don’t worry! Tampa Pizza Company has you covered. They can make a variety of gluten-free, vegan, and vegetarian options for your crew. The crust on the pizza is just the right consistency of crispy and chewy. The toppings are fresh. My picky son loved his basic pepperoni, while my mom and I were thrilled with our Hawaiian pizza. It is one of the best pizzas I’ve ever had. The prices at Tampa Pizza Company are pretty reasonable. The pizzas range from $6-30 depending on the size and toppings. Everything else on the menu falls in the $6-13 range, except for the wings, which can cost up to $27 depending on the number. The desserts are all priced under $10. You can easily feed your whole family here without busting the budget. There are two locations in Tampa. The one we visited was in downtown Tampa. It was conveniently located down the street from our hotel and about a block from the children’s museum and the Riverwalk. The other location is in the Westchase area of Tampa. 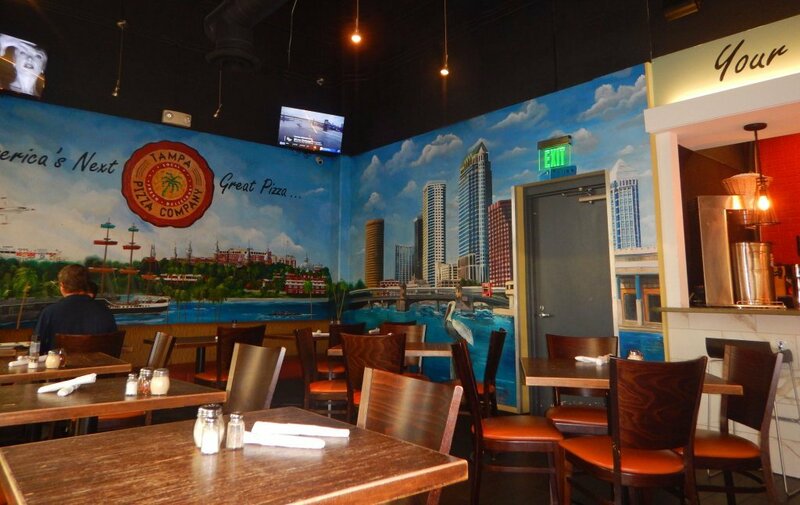 The decor of the Tampa Pizza Company focuses on the city. The walls feature an artistic mural of downtown Tampa. The atmosphere is cozy and laid-back. It will be as comfortable for your kids as it is for college students. This is a place where you don’t have to worry about your kids getting rowdy and breaking something. The mural of Tampa on the wall of the Tampa Pizza Company. The staff is generally made up of young college-aged adults. However, in my experience, the staff here was warm, hospitable, and attentive to our needs. On our first visit, the girl who waited on us was great with my son. She interacted with him and made him feel like he was her most important customer. We could not have been happier with the service. 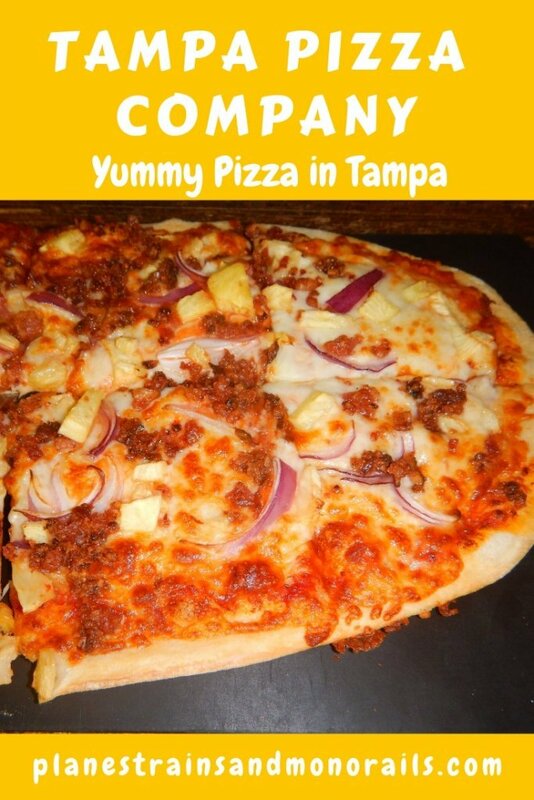 The Tampa Pizza Company is a wonderful place to eat with kids in downtown Tampa. The pizza is delicious. The atmosphere is inviting and kid-friendly, and the staff is very attentive. I highly recommend the Tampa Pizza Company to anyone who will be vacationing in the Tampa area with kids. For more on what to do in Tampa, see my article on the Florida Aquarium. For more details on the Tampa Pizza Company, visit their website. Happy travels!